Welcome to tutorial 45 in this series of tutorials designed to help you learn EasyLanguage programming skills. EasyLanguage is a programming language that is part of the TradeStation trading platform. It can be used to write programs to help in the technical analysis and trading of foreign exchange (forex or FX), commodities (e.g. the Dow e-mini, S&P e-mini etc), options, and stocks. 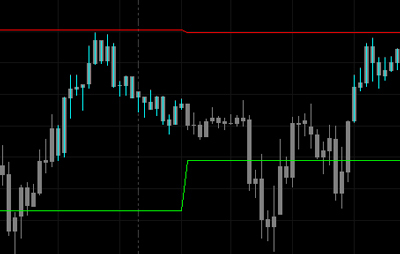 I am often asked by clients to create an indicator that plots the high, low or traders’ pivots for a specific session. For example, if you traded the USD/GBP Forex pair, rather than considering the entire day, you might be interested in the highest high and the lowest low of the period between 08:00 and 16:30 UK time (Midnight to 08:30 Pacific time – ignoring differences in the switch to daylight savings time). 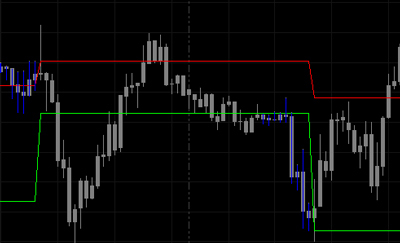 The downloadable indicator applied to 30 minute GBPUSD. Start time and end time are on the same day. Start time = 1000 and End Time =2000. The bars on which the high and low lines are base are highlighted in cyan. To create a program to do this is slightly more tricky, and I cover this in the video with a few examples. It can be even more confusing when the start of the period is today and the end, tomorrow. Another issue that you need to bear in mind is to take account of start times for which there may not necessarily be a bar plotted on the chart. For example, if we were sure that there would be a 0900 bar for the stock we were looking at, then you could set a start time of 0900 and do a simple test within the program, i.e. If T = 0900 then ….. However, what if there was no 0900 bar for a particular day? Or what if you entered the start time as 0845 and there is no 0845 bar? This tutorial explains how to resolve these potential issues and plot on the chart the highest high of a specific period, irrespective of when the period begins or ends. The download version also includes plots of lows as well as highs for a given period.